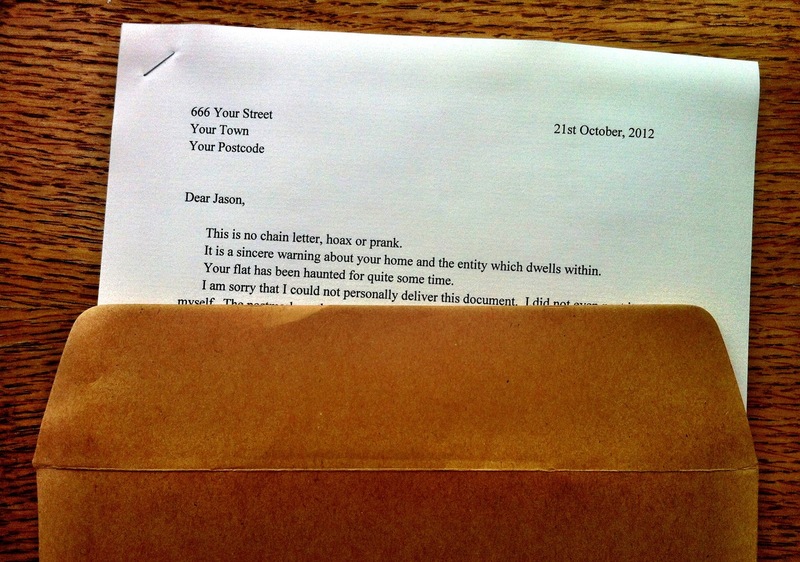 2) A physical, typed, paper letter which will be snail-mailed to your home address. Twenty-three sheets of paper in a card-backed A4 envelope. This, clearly, is the most authentic way to receive and experience A Sincere Warning About The Entity In Your Home. It'll look like this [check out the image here], except with your name and address at the top... Why your name and address? Because the text will be personalised in several ways. The letter will arrive with no cover artwork, story title, author credit or advertising blurb: just the URL of the official webpage (ScaryLetter.com) at the end, in case the letter is ever ordered for someone maliciously! I love this sort of stuff, and Jason has put a lot of effort in to help customise the story a little bit. I'm half inclined to get a copy, just to see how more effective a personalised horror story will be. *'huge' in the context of the writing industry, ie. a couple of lunches or a new XBox game, at least.